Hetty felt she wasn’t worthy of love; her aim to help others. Will Hetty allow love to consume her or will she purposely destroy it? Outstanding, this story is, complete brilliance. From start to finish, Hetty’s story consumed me. Sarah Michelle Lynch touches on the harsher realities of life. Her words are delivered, and written beautifully, you can feel the passion and emotion pouring from every word. 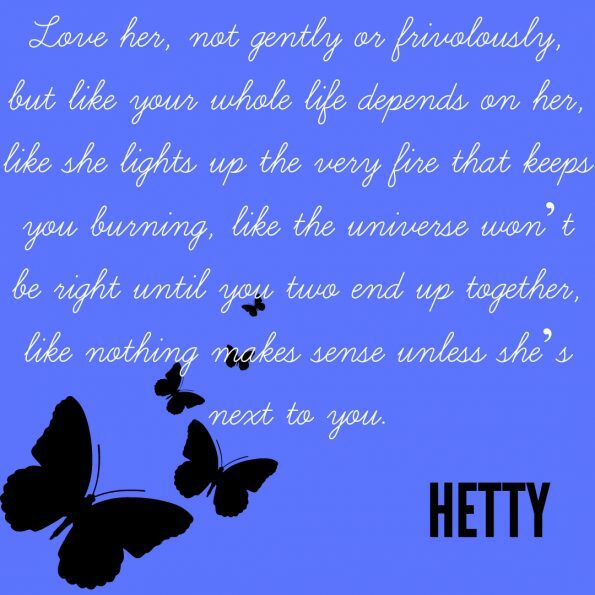 Hetty is heartbreakingly beautiful, her story will stir so many emotions within you. You will feel tears build, although they may not fall, from her most beautiful moments to her most tragic. Strong, intelligent, witty, caring, and loving is how I would describe Hetty. It’s hard not to love her character. She’s the kind of friend any of us would be lucky to have, and she doesn’t even realise it. Her determination to not be tainted by her life is inspiring. With the right people, around her she can achieve anything she puts her mind too. Of those people, that touched and changed Hetty’s life, you will find a special place in your heart for each one. The man that guides her along this path we call life, the man that showed her how worthy, beautiful, talented, and loving she is, and the man that showed her the harsh reality of where allowing your past to consume you, and dictate to you, can lead you down a much darker, harsher path, and in a twisted heart-rending way it is this man that gave her the push she needed to accept the things that were right in front of her. Hetty’s story is one I think many can relate to on some level. And if nothing else it will give you passion to live for the now and follow your dreams; to love with your whole heart and never say never. This story is perfect for contemporary romance readers and although this is a spin off from the Angel Avenue series, which I have yet to read, I believe you can fully enjoy and appreciate this story without reading the other books.